While the Air Force is theoretically supposed to be diverting the A-10’s operating expenses to feed the F-35 Joint Strike Fighter, the people in charge are now planning to keep the plane running. While the beancounters and product planners are trying to push the A-10 off the board, Materiel Command is going to keep on keeping the planes in peak condition, which will give the A-10 it’s best chance of proving its worth over and over again. 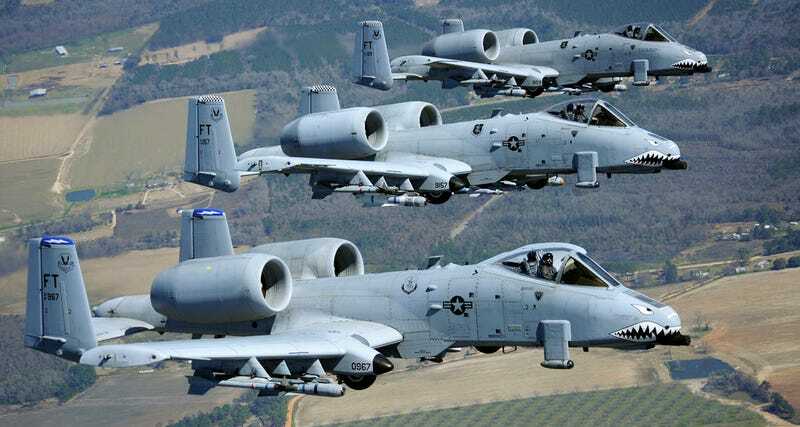 And it seems to be working– the A-10 posted a five percent increase in its availability rate from 2014 to 2015, and the Air Force seems to keep postponing its demise. The F-35 Joint Strike Fighter is supposed to be a do-it-all combat aircraft that can engage other planes in the sky, make long-range bombing runs and come in low and slow to support ground troops. It hasn’t gotten off to a great start, to put it lightly, and so far its effectiveness in any of those roles has yet to be truly tested in combat. That last move especially is the A-10’s specialty, and a big part of the reason the plane is so beloved by servicemen and women. To embattled soldiers on the ground, the only sound more reassuring than an A-10’s engine is the BRRRT of its massive front cannon providing you with cover fire. At least that’s the prevailing lore you’ve probably already heard about this plane already. The F-35 on the other hand, has established a reputation of being over budget and underperforming. To that end the Air Force is said to be in the process of putting new wings on its fleet of A-10s under a $2 billion contract with Boeing that was written up in 2007 and supposed to keep the planes going to 2028. It sounds like the next big hurdles for the A-10 are the Air Force’s fiscal year 2018 budget and a defense policy bill that includes a provision to keep the A-10 active. Specifically, Arizona Republican Rep. Martha McSally wants to put one last barrier between the A-10 and retirement: a jet-vs-jet flyoff against the F-35. We’ll be there with popcorn.